Oil change service is one of the most competitive segments of the car service industry. Estampe has genuine online savings on oil change stickers. The key to success is not only providing customers with quality service and great pricing, but also securing customers who return every 3000 miles. 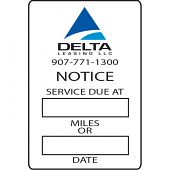 These labels are used as a small windshield sticker to help remind the customer of the next vehicle service date. 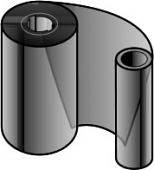 They are typically clear static cling or light adhesive. Ours are designed to be easy to apply and remove. All are simple and easy to read, heat/cold resistant, fade resistant and can include your company logo and information. They serve as a marketing and advertising tool for your automotive repair business, promote your oil products and serve as a reminder to your customer to return regularly. Service reminder stickers are among the most innovative and enduring used in the automotive repair industry. We sell many styles, including those that work with service reminder printer systems, as well as stock and custom oil change stickers and labels.